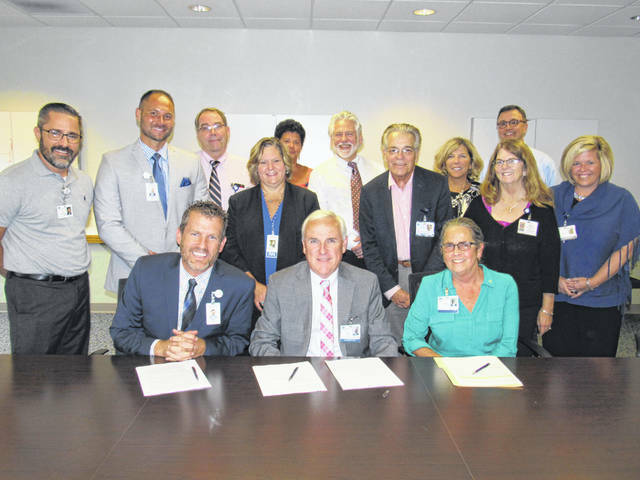 Fayette County Memorial Hospital’s CEO Mike Diener, Adena Health System President & CEO Jeff Graham, and Adena Board of Trustees Chair Virginia Wettersten sign an affiliation agreement between the two, independent health care providers. Members of FCMH and Adena leadership teams are also pictured. Fayette County Memorial Hospital (FCMH) and Adena Health System announced a partnership Thursday designed to provide better health care to the surrounding community. The affiliation agreement between the two organizations becomes effective Oct. 1, according to a press release. Over the past year, FCMH and Adena have collaborated to increase medical services for patients in the region with the addition of specialty services being performed at FCMH by Adena providers. The partnership began with orthopedics in August 2017 and continued with pulmonology in November 2017. Both FCMH and Adena Health System, which includes three hospitals (Chillicothe, Waverly and Greenfield) and six regional clinics, will still remain independent health care providers but will now collaborate more frequently. With the agreement, access to even more of Adena’s specialty services will now be available to patients on the FCMH campus, according to officials. These specialties include: cardiology, dermatology, nephrology, neurology, Ob/Gyn, and urology. Adena specialty providers will see patients and perform a number of procedures within FCMH facilities. This agreement will not incur any additional costs for FCMH, according to officials. Officials added that patients can easily schedule an appointment with an Adena specialist on the FCMH campus. Adena Pulmonology and Orthopedic specialists are located in FCMH’s Medical Arts Building #1, Suites 106 and 201, located at 1450 Columbus Ave. in Washington C.H. The newly-added Adena specialists will be housed in Suite 340 of FCMH Medical Arts Building #2, located at 1510 Columbus Ave.
https://www.recordherald.com/wp-content/uploads/sites/27/2018/09/web1_Adena-Fayette-Affiliation-agreement.jpgFayette County Memorial Hospital’s CEO Mike Diener, Adena Health System President & CEO Jeff Graham, and Adena Board of Trustees Chair Virginia Wettersten sign an affiliation agreement between the two, independent health care providers. Members of FCMH and Adena leadership teams are also pictured.